Lisbon is a beautiful city with lots of interesting sights, but historic Sintra and Porto with its old port houses are also well worth a visit. Residence Royale selected luxury villa rentals near Sintra and in Praya del Rey. These wonderful holiday villas are always located close to the beach or golf course, a perfect location for a perfect holiday. Villa Arello is a modern vacation villa in Foz do Arelho near Praya d’El ey on the Silver coast of Portugal. Wonderful vacation villa for 10 with 5 bedrooms, 5 bathrooms, heated pool, WiFi internet and sea view! 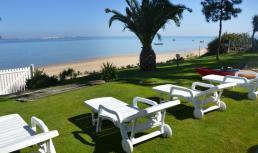 Villa Celesta is located on the Atlantic coast near Lisbon, close to well-known sea-side resort Cascais (10 min. drive). Beautiful, modern vacation villa for 10 with heated pool, WiFi internet and stunning sea view! 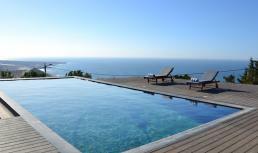 Villa Branco is a spacious holiday villa on the Troia peninsula south of Lisbon. Lisbon and Setubal can easily be reached by ferry (approx. 30 min). 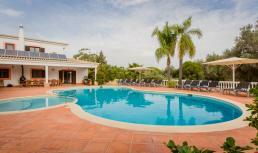 Lovely holiday villa for 12 with 6 bedrooms, 4 bathrooms, private pool and WiFi internet, only 500 m. from the beach. Perfect holiday villa for families with children! Villa Cosima is a spacious, modern vacation villa located in Cascais near Lisbon, only 200 m. from the beach. The villa can accommodate 16 to 18 persons, perfect for family gatherings. Superb, tastefully appointed vacation villa with heated pool, WiFi internet, air conditioning and breath taking sea view! Villa Marinha is a spacious vacation villa located in a quiet area near the Golf resort Quinta da Marinha, approx. 11 km. above Cascais. It is only a 5 min. drive to the beach. Wonderful, well-appointed vacation villa for 12 with heated pool, WiFi internet and breath taking sea view. Perfect villa for families with children! Villa Evaluna is a spacious holiday villa on the Troia peninsula south of Lisbon. Lisbon and Setubal can easily be reached by ferry (approx. 30 min). Lovely holiday villa for 16 with private pool, WiFi internet, air conditioning, fantastic sea view and direct access to the beach! Villa Cyclamen is a fantastic holiday villa for14, located on the Atlantic coast near Estoril within walking distance to the beach (800 m.). Wonderful, modern villa with private pool, fenced children’s pool, tennis court, WiFi internet and breath taking sea view! Villa Negrita lies in the Aroeira Golf resort, only 2 km. from the beach and 25 km from Lisbon. The resort has 2 golf courses, 4 tennis courts, restaurants and supermarket. Luxury vacation villa for 10 with private pool, air conditioning, WiFi internet and a private golf green with 3 holes! Villa Cassina is a luxury vacation villa located in Cascais near Lisbon (Portugal), only 2.5 km. from the beach. Wonderful, well-appointed luxury vacation villa for 12 with heated pool, air conditioning and WiFi internet!